The Barking Cow Ice Cream Parlor is the home to Old Fashioned Ice Cream in Gaston, Indiana. The Parlor got their name by digging into the town’s archives and discovering an interesting story. In 1913 there was a series of gas well fires that tore through the town. One fire destroyed an entire cattle barn except for one cow who was then placed in a pen with dogs. The same farm experienced another gas well fire and to alert the farmer, the cow began to bark. The name “The Barking Cow” was then born. 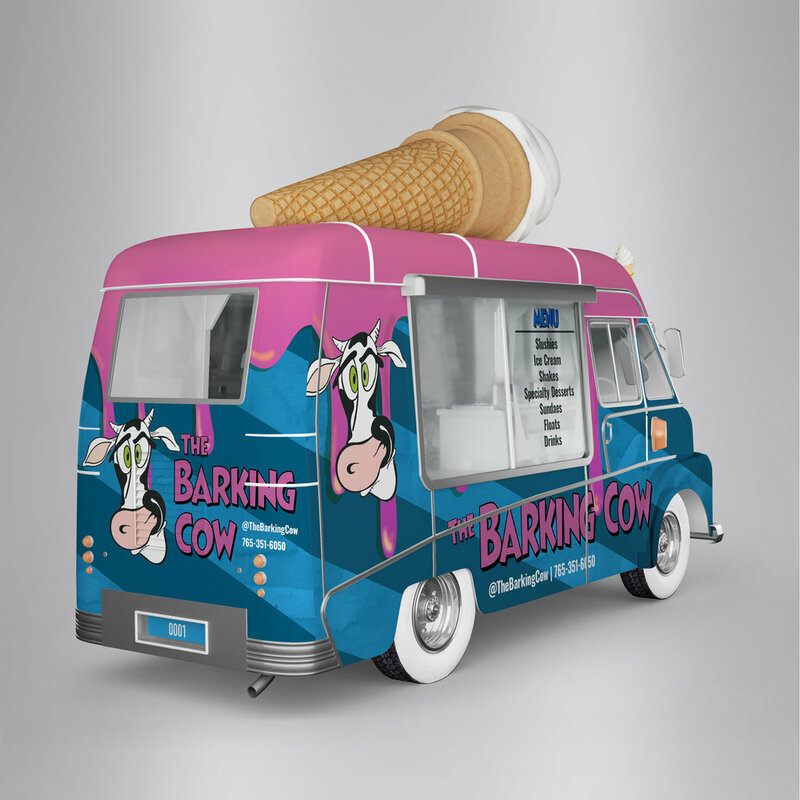 The “mascot” of the Ice Cream Parlor became a huge hit, and the owner named the cow Sylvia after his grandmother. When drawing up design ideas, I began to think of way I could play on the fun and quirky style of The Barking Cow restaurant. I knew I wanted to keep the menu to strictly ice cream because that is what they are most well-known for and I wanted to display the menu in a more unique way, not just the traditional menu card or trifold. After playing around with set ups for the menu, I finally settled on having the menu be able to be folded up with “tabs,” so the customer would know where to open it up to if they wanted ice cream, sundaes, or anything else The Barking Cow food truck served. When working on the food truck design, I was focused on making it look fun and drawing the customer in. I used the melting ice cream drips to express that the truck only served ice cream and it made the truck a little bit more playful. I also used the diagonal lines to represent the swirling of ice cream. I incorporated the diagonal lines and the drips into my packaging as well. On the cups for the ice cream and sundaes, the cone wrap, and the slushy cups you will notice similar designs to show a cohesive look when the items are taken away from the truck. Every piece of packaging, the menu, and the truck all include Sylvia’s head because she is such an important part of the history of not only the town, but the business as well. She is the reason the business is what it is and I wanted to keep that true to the food truck as well.